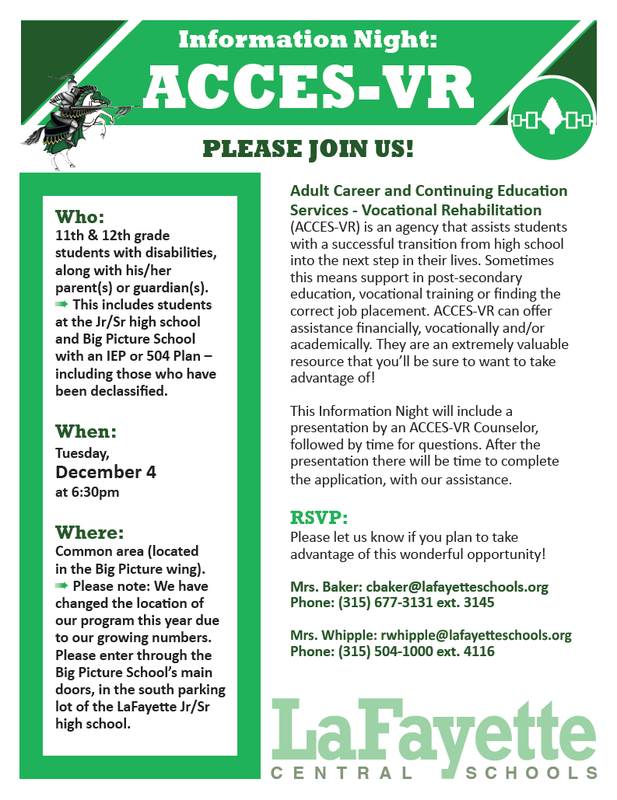 On Tuesday, Dec. 4 the Adult Career and Continuing Education Services - Vocational Rehabilitation (ACCES-VR) agency will host an information night. It will be held at 6:30 p.m. in the Big Picture School common area. ACCES-VR is assists students in making a successful transition from high school into the next step in their lives. This could mean providing support in post-secondary education, vocational training, or finding the correct job placement. ACCES-VR can offer assistance financially, vocationally and/or academically. This information night is intended for juniors and seniors with disabilities, as well as their parents or guardians. Please click on the flier below for more information about the event.